Learning about money is one of the most-important things that a child can pick up in their early years. 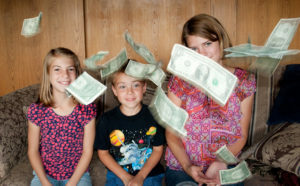 At some point, your kids are going to need to start earning their own money, and they will need to know how to handle that money in order to become successful and prosperous adults. You certainly don’t need to be rich in order to enjoy life, but you do need to know how to manage your money in a way that will keep you on the right track for the long run. If you would like to teach your kids some lessons about money that will last a lifetime, consider using the following methods to easily teach your kids about money. Giving an allowance is one of the easiest ways to teach your kids about money. This is a time-tested plan, and it is one that is used by so many people because it is so effective. Giving your children an allowance in exchange for completing some basic chores around the house is a lot like giving them their first job. They will learn that money has to be earned, and they will also learn that they need to save that money if they want to buy things later on. The next step after giving your children an allowance is to make sure they understand how important it is to save money. Money that is earned should not be spent immediately, but that is a lesson that isn’t understood by all adults, let alone children. Encourage your kids to save at least a portion of what they earn through their allowance, and they will have a greater appreciation for money as they grow older. Grocery shopping is one of the basics of managing your budget, and taking your kids shopping with you is a great way to help them understand how money works and how they can look for savings. As you shop with your child, teach them to look at prices and make decisions based both on need and budget. If they see you simply grabbing things off the shelf without any regard for prices, they will never come to understand how important it is to shop smart. Another ways to teach your kids about money is by helping them open a bank account. A piggy bank might work just fine when your kids are small, but opening a bank account for them as they get a bit older is a great way to take their financial education to a new level. You can begin to deposit their allowance into the bank account, and any other money they earn can go in there as well. It is easy for kids to take things for granted. They don’t understand just how expensive it is to live a ‘normal’ life. When you kids are old enough to understand, teach them about things like mortgage payments or rent costs, utilities, car payments, insurance, and more. Just a small amount of education on these points can go a long way towards helping them understand why it is important to save money whenever possible. Have you used any of these ideas to teach your kids about money? What else have you done to teach your kids about money? That last one is a biggie IMO. At least it was for us. Our daughter is now in college and, versus many of her friends, she isn’t totally surprised by the cost of many things. She has been exposed to “adulting” earlier in life and that makes it a bit easier for her to handle now.